Here is my card for the week over on 2sketches4you. This is Kazan's Sketch #8. 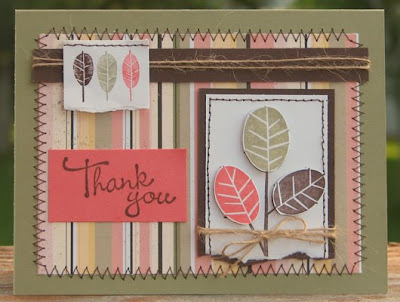 I used Stampin Up for everything except the string and the thread in the sewing. I am hoping to get the bonus card for this week done, too, but it probably won't be tonight.....maybe I can squeeze in a few minutes tomorrow. I have been really busy preparing for the baby and I had a couple of family functions this week, so I haven't really had much time to work on things and I know in the next few weeks, time might be a precious thing. It is anybody's guess as to when the baby will be here. Lovely card, great stitching and colours.